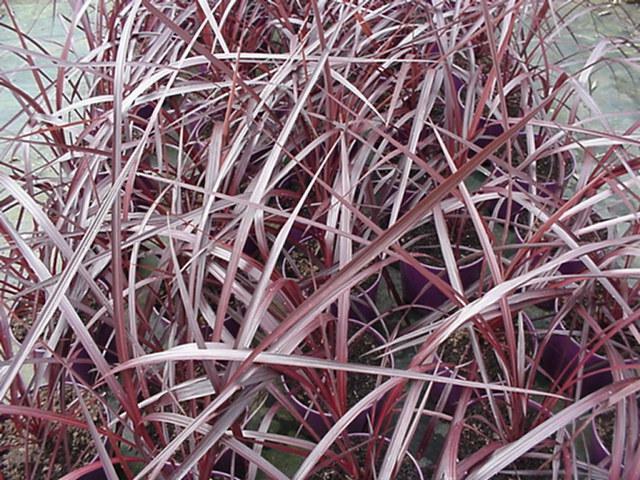 CORDYLINE RED FOUNTAIN (syn. Festival Grass and Festival Burgundy). A flagship Jury plant, this one, the result of many years of effort which started with two different plant genus altogether. Initially there was the work Felix did with coloured and variegated flaxes (phormium). One of the most successful plants internationally became Phormium Yellow Wave – widely grown to this day in British gardens. We have always joked that had Felix received just one cent royalty for every Yellow Wave sold, we would never have had to earn a living but back in the 1960s, there was no protection of intellectual property rights and no expectation that a breeder be rewarded financially. There were other coloured cultivars (including Misty Sunrise and Pinky) from the breeding flurry but these have not stayed in the marketplace as Yellow Wave has. However, these coloured phormiums perform better in other places than our climate with its high humidity. We struggle to keep good foliage and they look pretty tatty and badly marked by insect and rust damage along with growing too large for a small garden. So Felix moved on to the next plant genus which offered similar clumping habit and pointed leaves without being spiky. Over 30 years ago, Felix and Mark were both fascinated by the habit and appearance of our native Astelia chathamica (often sold under a cultivar name of Silver Spear). There was little that needed improving in the pointed silver leaves of this clump forming plant, but both father and son saw the potential in trying to create a different colour-way with red foliage. So began a twenty year effort before Mark pulled the plug and decided that his red astelias were simply too difficult and too unreliable to market widely. We still have them in cultivation in the garden here and a few of the selected clone were released by us onto the market. Other seedlings found their way onto the market by devious means on the part of a third party (that is a story best kept in-house) but clearly others found the plant just as difficult to build up – and indeed to keep alive at all – because it has never been a huge commercial hit despite the demand. Sometimes breeding directions are more blind alley than interesting path and Mark reluctantly abandoned the red astelia. Undeterred, Felix looked to the cordyline genus where he crossed two lesser known NZ forms – banksii and pumilio. In this country where Cordyline australis is by far and away the most common form around (called cabbage trees and an icon of our country), cordylines are expected to have trunks and grow several metres tall. When Mark raised the seed from this cross, there was the lucky break which came to be called Red Fountain in the first instance (but also marketed in the US as Festival Grass and Festival Burgundy). It is clumping, rarely putting up a trunk much above 10cm with exceptionally good colouring in shiny burgundy red which lasts all year round. The narrow strappy leaves are relatively soft and fountain out around the base. In early summer, the tall, arching flower spikes are in pale lilac and highly fragrant. We have been delighted at the success of this cultivar on the international market, thanks to the efforts of Anthony Tesselaar International in the capacity of our agent. Less delighted, one might say with the efforts of competitors to come in behind it with ring-ins and substitutes, some even raised from Red Fountain (how we wish they would show some originality and come up with their own ideas) but we are confident that nothing has yet appeared that is the equal of Red Fountain. Mark has continued with the cordyline breeding, but with the market being flooded with different cordylines from other sources, many proving difficult and unreliable, he has put any further releases on hold. 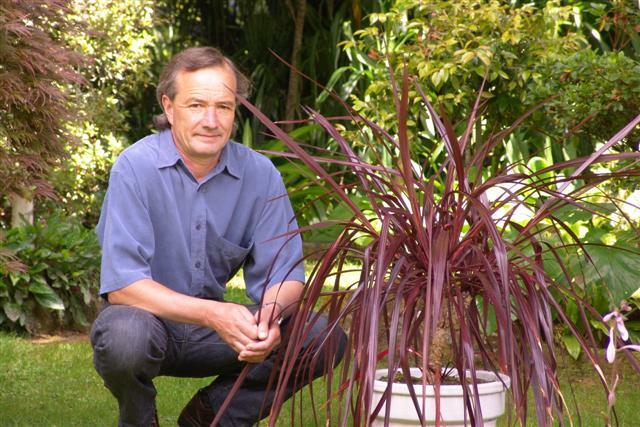 This entry was posted in The Jury plant legacy and tagged Cordyline Festival Burgundy, Cordyline Red Fountain, Felix Jury, Festival Burgundy, Festival Grass, Jury plants, Mark Jury, Phormium Yellow Wave, red astelias on 26 May 2010 by Abbie Jury.